I wanted to try making cornstarch dough after seeing the beautiful mushroom and beads by 5 Orange Potatoes. Her recipe calls for equal parts cornstarch, baking powder and water, mixed with half as much salt. That seemed like a lot of baking powder to me, so I searched around and found another cornstarch dough recipe for 2 parts salt to 1 part cornstarch plus water. I decided to try and make both. I was feeling a little lazy and so I didn't look up if it should be baking powder or bi-carb soda. In retrospect it was probably bi-carb soda, but seeing as I had more baking powder on hand, I used that. In the same way I assumed cornstarch was equivalent to cornflour. Both recipes were dead easy to make. The kids adored that it was fresh, home made and they helped to make it. Even better that they could keep and paint their creations when they dried. The recipe with the baking powder was an opaque white colour (and a little dry and crumbly, I think I'd try and improve that next time). 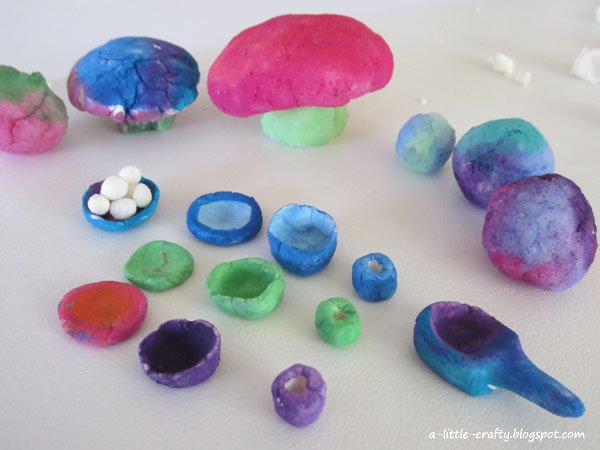 The cornstarch and salt dough had a beautiful slightly translucent white colour to it. I had a tiny paper cut on my finger, and working with the salt dough was like (to use a phrase) rubbing salt into a wound. Not very pleasant. Miss 3 had no problems with it, but I worried about the fingers of Mr 4 who suffers from eczema quite badly. The recipe with baking powder was not a problem and nice to work with. 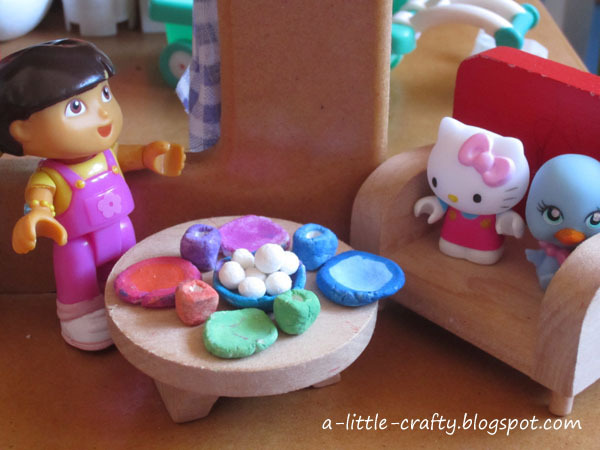 In the photo above, the pink mushroom and balls were made using the salt dough, and the dolls house kitchen accessories and smaller mushroom were made with the baking powder recipe.